La Harpe: This year's Fred Gibb Memorial car show had a total of 375-400 cars despite the hot weather and higher gas prices. Semis were a new item at the 9th Annual Fred Gibb Memorial Car Show this past weekend in La Harpe. These five are used in the farming business to haul grain. From left Semi's are owned by Steve and Aron Sowers of Colchester, the next two are Bill and Tyler Carson of Colchester, and the 4th one belongs to Brad and Dave Hunt of Blandinsville who hauls commerically, and the last one is D&K Grain Corp.belonging to Dan and Karla (Markham) Bowman from Stronghurst who buys grain from farmers. Parked in front of "Nothing New" in La Harpe, just before the 9th Annual Fred Gibb Memorial Car Show, the above picture was taken. 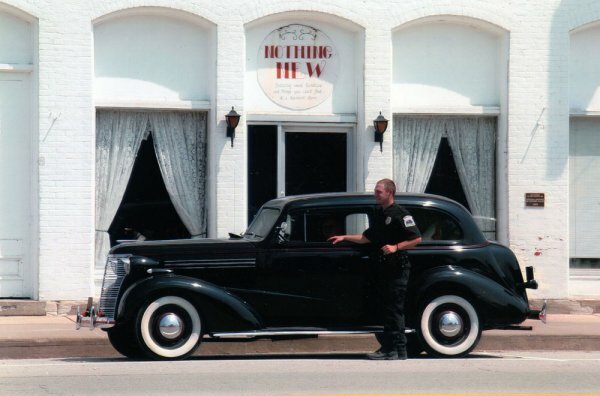 The photographer undoubtedly thought the antique car with the sign in the background looked pretty funny. This is Darrell Kraft's automobile and La Harpe Deputy Eric Krekel stopped to visit.